Klipfolio provides an online dashboard platform for building powerful real-time business dashboards. By focusing on a combination of user self-service, mobile, and cloud-based BI, Klipfolio is well positioned to get significant traction in a market where there is a strong potential growth in BI adoption. Klipfolio, a global leader in cloud-based Web and mobile dashboard solutions, today announced it has secured $1.7-million (CDN) in funding, led by the BDC Venture Capital IT Fund, Mistral Venture Partners and including several leading early-stage investor groups from both Canada and the United States including Fundfire (Ottawa), BOLDstart Ventures (New York), Acadia Woods (New York), and CommonAngels Ventures (Boston). 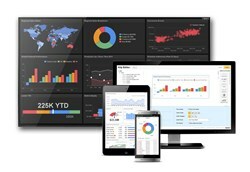 The Ottawa-based startup has recently grabbed the attention of industry watchers and many of the world's most recognized brands for its real-time business dashboard, a flexible and powerful solution that allows business users to unite cloud-based and on-premise data sources to create meaningful dashboards without the cost or complexity of traditional business intelligence tools. Klipfolio has experienced dramatic year-over-year organic revenue growth and has a growing customer list that includes Fortune 500 companies. "The decision-making landscape is changing. Line of business users are desperate to consolidate and visualize the overwhelming number of metrics they need on a daily basis," said Allan Wille, Chief Executive Officer, Klipfolio. "The future is all about making business intelligence software easier, friendlier, smarter, and more cost-effective – and with today's announcement, Klipfolio is making this happen." With 200 million visitors to its site annually, Edmunds.com needed a solution that gave it real-time insights into its business. "How you present data really matters. It matters in the sense of the story you want to tell as well as how digestible and actionable it is for the end user. We chose Klipfolio because of how easy it was to integrate with our back-end data, and the ease of learning the UI in terms of transforming and getting value out of that data,” George K. Kang, Vice President, Inside Sales & Dealer Development, Edmunds.com. Trusted and relied upon by 1,100 organizations around the world including leading global brands, Klipfolio is a global leader in cloud-based Web and mobile dashboard solutions. Klipfolio provides an online dashboard platform for building powerful real-time business dashboards. Unlike traditional or legacy BI solutions, the Klipfolio solution is being selected by customers as a cost-effective, flexible solution that allows the seamless integration of diverse sources of data into a dynamic dashboard to monitor business performance. With customers in healthcare, financial services, consumer packaged goods, government, non-profit and marketing, the Klipfolio cloud-based solution is designed to help business decision-makers in medium to large-sized enterprises make better decisions. Find out more at http://www.klipfolio.com or follow us: twitter.com/klipfolio.